We apply Monte Carlo simulation to determine the probability and severity of losses and return-on-exposure (ROX) to tranches of a synthetic CDO. 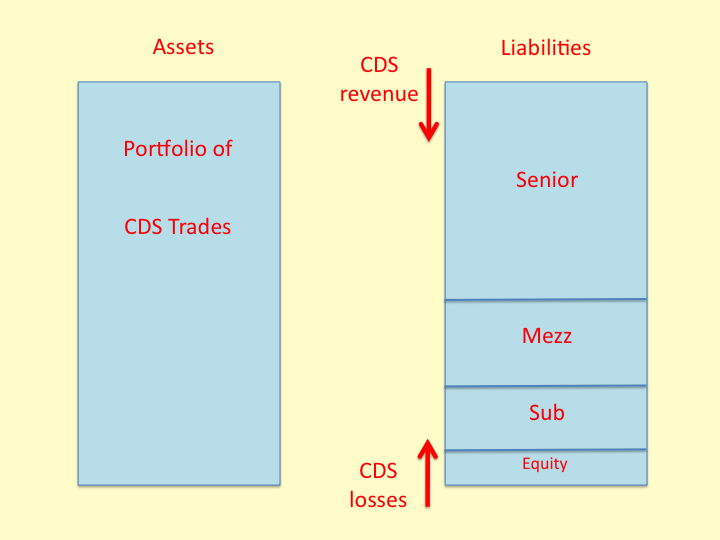 The user specifies a portfolio of CDS trades with running spreads, upfront amounts, credit ratings, LGD assumptions and "region" and "industry" information to implement user-defined correlation assumptions. The model implements a revenue waterfall to pay losses, if any, and spreads to the tranches in order of seniority. The model imposes losses first to the equity (not shown) and then sequentially to the most subordinated remaining tranche. Each tranche investor pledges collateral upfront. The collateral pays losses, earns LIBOR, and pays the LIBOR interest to the investor. The "PD Rating" and "EL Rating" are credit ratings determined by Default Probability and Expected Loss definitions, respectively. When the OC Test is failing, excess spread pays down principal of the most senior outstanding tranche.